Blackburn with Darwen Council has launched an appeal to recruit 20 new foster carers at the start of national Foster Care Fortnight (May 12-25). Local foster carers are urgently needed to look after vulnerable children and young people – from babies to teens – who can’t live at home for many different reasons. The Council has relaunched its ‘Happy Families’ style marketing campaign to recruit new carers. 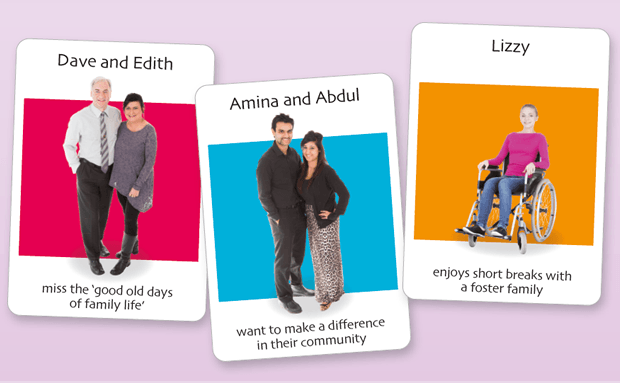 Based on the popular card game, the campaign posters feature matching pairs of prospective foster carers and children who need a home – previously featuring cartoon figures, they have now been updated with photographs of local residents, illustrating the many different reasons why people might foster. The Council’s fostering team will staff an information stand in the Mall, Blackburn, every day next week (May 12-16) from 12 noon to 2pm, to speak to shoppers and answer their questions about fostering. There are many different types of fostering, from short-term placements and short breaks for families with children with disabilities to providing a long-term or even permanent home. Fostering is a rewarding, paid and professional role that comes with extensive training and on-going support. Foster carers come from a wide variety of backgrounds and can be considered regardless of gender, age, marital or job status. There are opportunities to find out more at the fostering information points on May 16, 3pm-4pm, at Royal Blackburn Hospital Information Point, May 17, 11am-2pm at the Barlow Institute, Entwistle, and on May 21, 1pm-2pm: Asda, Blackburn. In addition, a drop-in fostering information evening will take place on May 29, 6pm-8pm, at Shadsworth Children’s Centre, Shadsworth Road, Blackburn, when there will be the opportunity to speak to social workers and existing foster carers. For an informal chat about fostering or to receive an information pack, please contact freephone: 0800 328 6919 or visit the website, www.letsfoster.co.uk for more information.